Talent Skatepark, located in South Burlington, Vermont is an indoor, air-conditioned skatepark that is open 360 days a year. The Skatepark is 8,300 square feet and features a plaza, street course, bowl and micro mini-ramp. 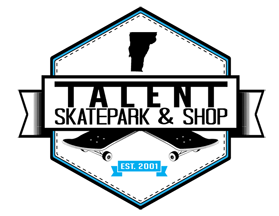 In addition to the skatepark, Talent is also Chittenden county’s largest full service skate shop with a huge selection of skateboards, longboards, safety gear, helmets, skate shoes, sneakers, skate clothing, in-line skates, freestyle scooters, and snowboards. We offer lessons, camps, and clinics to cultivate the next generation of skaters.